There's a lot of record projects going on right now starting with the "ever so rad" STALAG 13. These guys are putting out a nine-song e.p. on Upstart Records called "In Control". Get it! ILL REPUTE's album is coming out on Mystic Records. It's called "What Happens Next" with many powerful songs including the hit by Paul Revere and the Raiders, "Cherokee Nation" (GREAT). Also out on Music is DR. KNOW with their album "Plug-in Jesus". I haven't heard anything off this album yet, but I'm looking forward to it. Next is AGRESSION. We've been real busy this last month. We just got done recording a new version of S.A.T.C. for the new compilation which is entitled "COP-ulation". All songs have something to do with cops. Other bands featured on this album are BLACK FLAG, WHITE FLAG and ILL REPUTE. 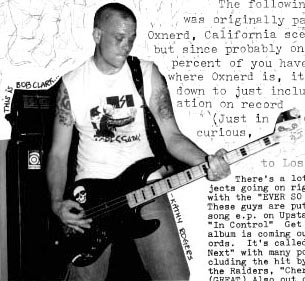 We've also started recording for the Oxnerd compilation featuring all the bands in Oxnerd. After that we're going to start recording for our 2nd album, and planning our first REAL TOUR.